Considered by some as useless and unaccessable swamp full of mosquitoes – in fact the mangroves present a fascinating and important ecosystem , and within it is teeming with life. Building a bridge between land and the sea, mangroves serve as a nursery for reef fish, haven for small marine life and habitat for a peculiar community. Mangrove trees can drop more than 700 tons of leaves per square km per year. 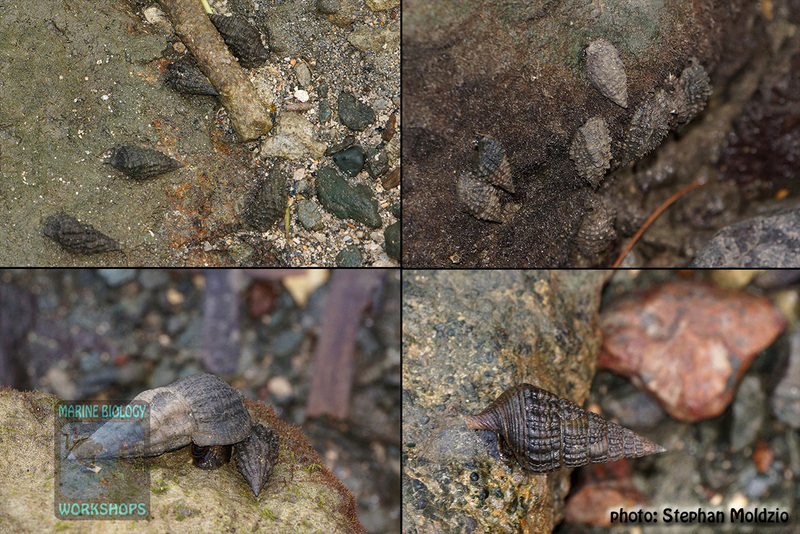 Mangrove leaves and dead seedlings are being devoured by snails, crustaceans, worms and others, which in turn are food for the higher stages of the food web. The remaining parts and mud, which has still a certain content of organic material, is cracked down further by bacteria and fungi, which are food for microorganisms, filter-feeding sponges, and detritus-feeders, like sea cucumbers. And again: everything goes up the food chain – straight to the fish, birds, mammals at the top. 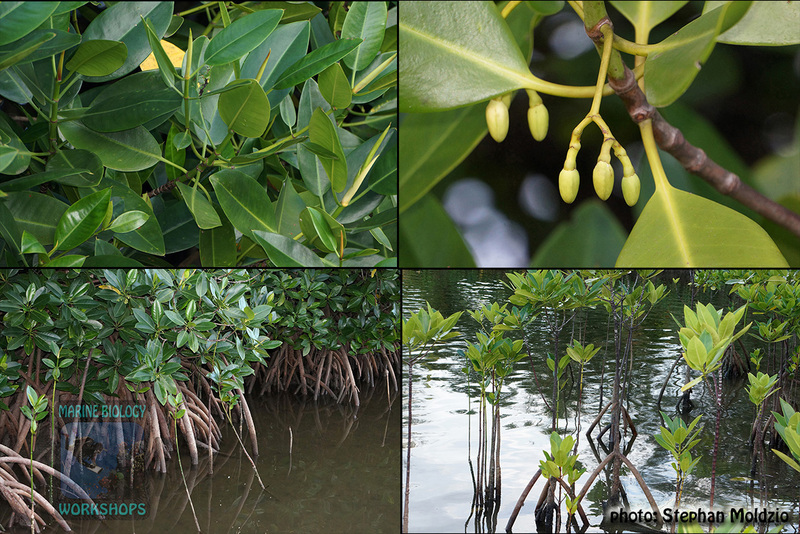 Therefore the mangroves provide a constant nutrient and food supply for the associated fauna and flora, as well as adjacent ecosystems, e.g. the coral reefs. At the direct border to the sea, and inside the lagoons, bays and rivers, the mangrove stilt-roots are marching out to expand their living space. Water currents are effectively lowered through the thicket, thus, sediments can settle down in this sheltered space between the roots, creating an unique mangrove ecosystem, also called “Mangal”. Mangrove trees are best adapted to the stressful conditions of saltwater immersion. Tides are washing in and out, the muddy soil lacks oxygen – no other trees may survive here! Mangrove trees are able to extract their fresh water from the salt water, and some species then just expel the salt through their leaves. That can be seen as visible salt crystals on the leaves. Plank-roots, that are undulating, horizontal ribbon-like roots above the ground. 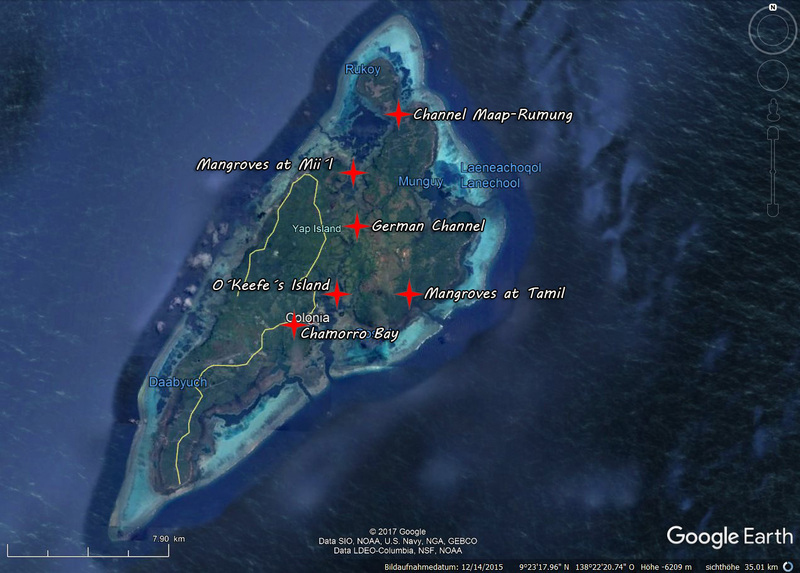 According to a terrestrial biodiversity survey from 2002 (M. C. Falanruw) for the “FSM National Biodiversity Strategy and Action Plan Project”, Yap has the most diverse mangroves and the most species of mangrove trees within the Federated States of Micronesia (FSM), with a total number of 15 species, whereas Kosrae, Pohnpei and Chuuk have only 10 species each. Rhizophora stylosa is the most common mangrove at the seaward margin, they form prominent stilt-roots and elongated, pointed seedlings. There occur three other Rhizophora species at Yap. Bruguiera gymnorrhiza prefers low salinity areas with freshwater input and therefore occurs mainly from the middle to the inner mangrove zone. They have conspicuous knee-roots and form elongated seedlings, similar to Rhizophora spp. Sonneratia alba forms conical Pneumatophores arising from the anoxic, sandy mud. It occurs within the whole Mangal, from low to high salinity areas. The leaves and seedlings are rounded. Xylocarpus spp. form heavy fruits with a diameter up to 20cm which are therefore called by the locals as „canon balls“, cause they produce a loud splash when they fall down in the water. They occur within the inner zone and prefer a low salinity. At places where a minimum amount of light is available, algae grow on the roots or any other available kind of substrate. 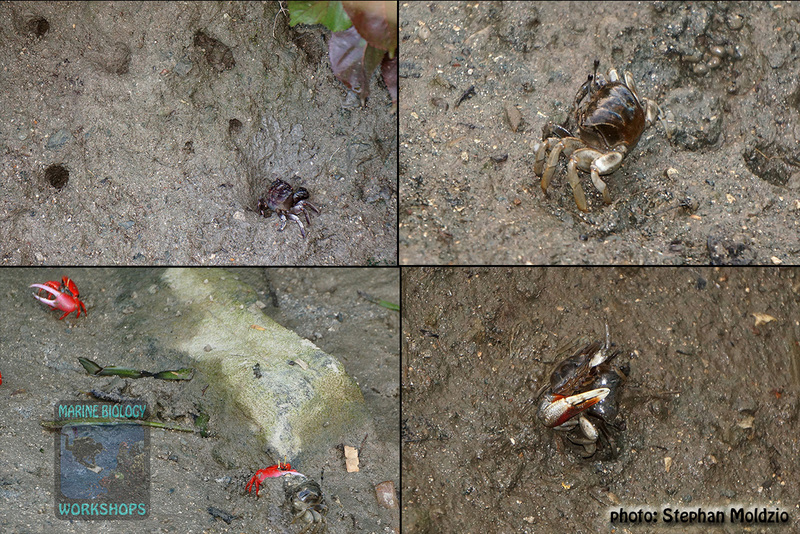 Occasionally snails and crabs can be seen underwater, tunnels within the sediment give a hint towards their inhabitants. The shy Banded archerfish (Toxotes jaculatrix) patrols swiftly through the stilt-root thicket. This fish got its name, cause it targets insects which are sitting on a branch up to several metres above the water surface, in order to shoot them down with an accurate rush of water to devour it. Another wonder of nature, how these creatures could make this as its life concept, despite the difficulties due to the refraction of light through the water surface. Between some branchwood fallen into the water – a group of Silver moonies (Monodactylus argenteus) hangs around. In the sunnier vicinity I spot various other mangrove-associated fishes, like half-beaks (Hemiramphidae), various Cardinal fish (Apogonidae), Mojarras (Gerreidae) and Whiptail Breams (Nemipteridae). Within the thicket of roots, juveniles of various reef fishes find shelter. The mangroves are widely known for their importance as nursery for reef fish. 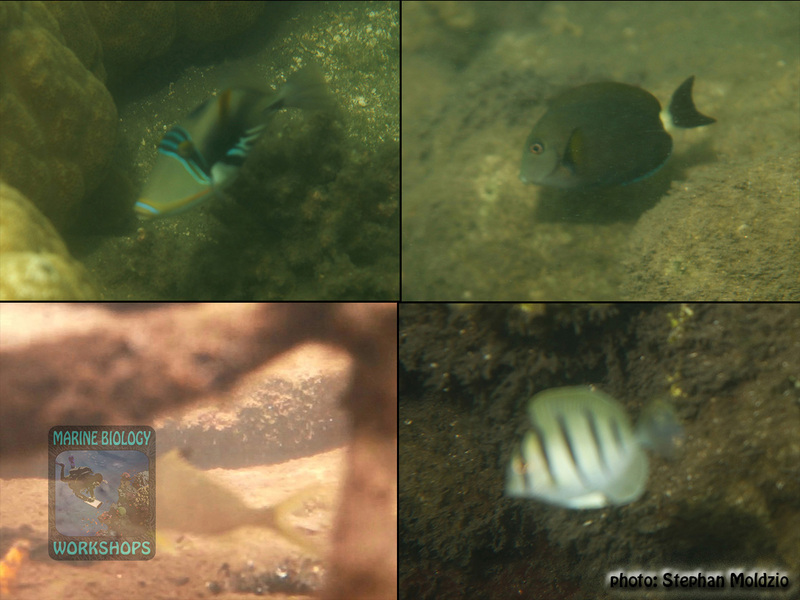 Now I see juveniles of various reef fish, e.g. surgeonfishes (Acanthurus triostegus and A. nigrofuscus), Triggerfishes (Rhinecanthus aculeatus) and others. Tunicates are highly evolved organisms and ancient relatives of the vertebrates, including us humans. Actually, tunicates and vertebrates belong to the same tribe (Chordata) within the tree of life. But after their larval stage in which they resemble a vertebrate larvae, they just settle down on a free place on hard substrate in order to become a brainless filter-feeder, same as the much less developed sponges. A huge amount of the worlds´ mangrove forests have already been destroyed through rigid coastal development, or by the shrimp-farming industry. Since whole mangrove systems have just been eradicated all over the globe, we should consider their real importance, not only as an unique ecosystem and haven of biodiversity, that plays a crucial role for the adjacent marine environments, especially the coral reefs. Not only this, mangroves also protect the shorelines from tidal erosion and heavy waves from tropical storms as a second front line, straight after the coral reefs which are the first fortress against the power of the oceans. Just to give an example – this has clearly been recognized after the devastating Tsunami in 2004 in Sumatra, where mangrove areas had experienced a much lower death toll than unprotected areas. Especially in view of rising sea levels the coastal protection provided by healthy mangroves, should be seen as a very important aspect and the remaining mangroves will play an increasing role for coastal communities in the mid-term. Simply said – the mangroves have to be protected, so they will protect us.